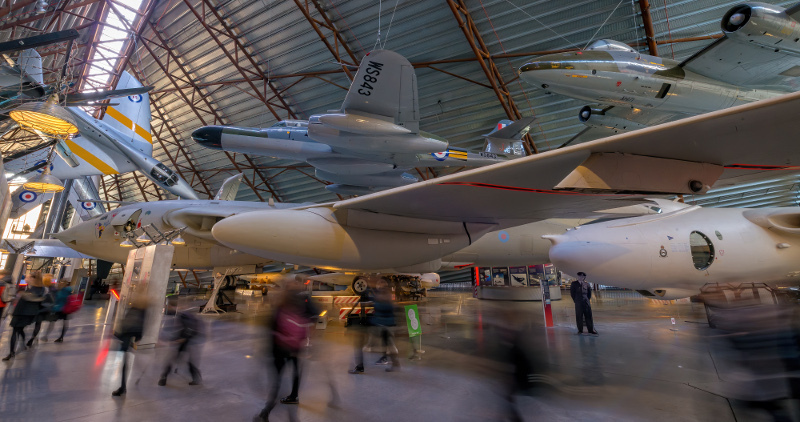 The Royal Air Force Museum Cosford is home to over 75 historic aircraft and offers a fun, entertaining day out for the entire family. Aircraft on display includethe world’s oldest Spitfire, the unique TSR2 and the mighty Vulcan bomber to name but a few. Plus, visitors can now see the museum’s latest acquisitions; a collection of Second World War aircraft including the Bf109 and Tiger Moth and from Spring 2017 the Wolverhampton built Boulton Paul Defiant, the Gladiator and Ju88 will also be on display. Discover a world class collection of aircraft displayedinside three wartime hangars and within the award winning National Cold War Exhibition. This landmark building truly has the ‘wow’ factor with its eye-catching architecture and design. Visitors will discover Cold War stories in immersive Hotspots; explore thrilling displays of aircraft, iconic cars, models, tanks and even life-sized Russian dolls. Set amongst the museum’s collection of warplanes, three iconic First World War aircraft; the Sopwith Pup, Sopwith 1 ½ Strutter and the Bristol M.1c form the centre piece of the ‘First World War in the Air’ Exhibition. Displayed alongside the aircraft are the personal items of Second Lieutenant Kevin Robert Furniss of the Royal Flying Corps (RFC), who lived only a few miles from Cosford in Wolverhampton. Learn if you have what it takes to be a pilot in Fun ‘n’ Flight which is packed with hands on excitement. Whether you’re learning how to fly a Spitfire, investigating air flow with ‘The Blower’ or guiding a Hercules to a drop zone you will be learning and having fun. Let your imagination take flight on board the Museum’s 4D Experience which combines cutting-edge 3D computer animation with the added fourth dimension of special environmental effects, including seat movements, water spray, leg ticklers and smoke effects. After wondering in the hangars, visitors can relax and enjoy a coffee in the licensed Refuel Restaurant which has a great selection of hot and cold food available and views overlooking the airfield.Or, if it’slight refreshments you are after, head to the classic Citroen H Van in the National Cold War Exhibition and enjoy a snack against a backdrop of aircraft. RAF Museum Cosford is one day out that everyone will enjoy, whatever the weather and with a wide range of exciting events taking place throughout the year, there is something to suit all ages. Access around the Museum is easy with wide aisles for pushchairs and wheelchairs. Wheelchairs and electronic scooters are available free on arrival at the admissions desk, on a first come first served basis.